Social Justice Camp II: The Empowered Are Back is less than a month away. It will be on two weekends. It will have two locations. These two weekends will bookend and support the work of some amazing local activists and artists. On January 15 and 16, the traditional social justice group will meet. On January 21, we will collide worlds, and social justice will meet health at 7:30 pm at St. Paul’s Lutheran Church, located at 4900 Connecticut Avenue. There will be an ignite speech session. These speeches will only be five minutes long and will ignite the passions of the diverse audience. The next day, on January 22, we will start at 10:00 am in an unconference and do many breakout sessions about health and social justice topics until 3:00. We shall build an amazing web of advocacy. Have you ever truly stared at a spider web? Have you seen it glistening with dew at sunrise? It is a thing of beauty. It is amazing that such a small creature could create something so immense, so beautiful, and so connected. The small spider may seem to work alone on this, dutifully extruding the silk that shall become the web; but all would fail without supports, without connections. Would there be a web without the branch, the shed, or the fencepost to provide a purchase? The web does not exist without a network of support. The web is an amazing tool; it catches sticky thoughts and activates people, and it grows. I was invited to attend Health Camp DC by Mark Scrimshire (he is part of my Twitter web) on November 12, 2010. It was a wonderful event. 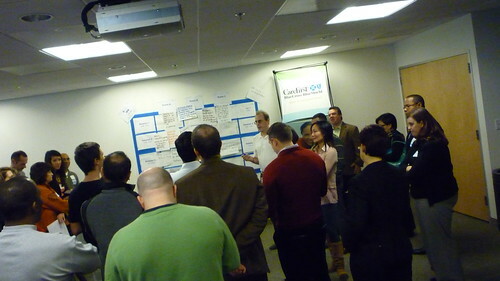 It was hosted in an unconference format and the participants were from diverse health and tech backgrounds. I went to several breakout sessions, and in each session people began to focus on what health services were available to the poor, underrepresented, or disadvantaged within our community. As the conversation went further, I realized most of the people had never worked with the activist community in DC. They had few contacts with those people already making a difference in the public health within community. I was amazed. I asked if anyone had attended Social Justice Camp. 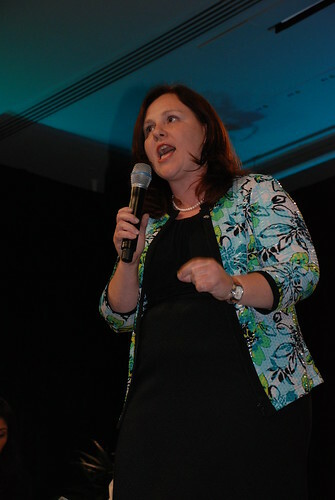 I learned that only one attendee, Cindy Throop, had. I decided at that moment that Social Justice Camp must meet the Health 2.0 movement. What is Social Justice Camp? It consists of an ignite session of short speeches and an unconference. Last year, I was invited to attend Social Justice Camp DC on MLK weekend by Aaron Ginoza. He read about my work on Twitter and thought I would be a good addition to the ignite session of Social Justice Camp. I went with my friend Cindy Throop. It was an amazing night! I met so many empowered and energized activists like Greg Woods and Kelli Shewmaker. They were so inspiring. Then sixteen people gave rapid fire five minute speeches with twenty slides, and I got a very fast immersion education about public health, homeless causes and the power of social media in Washington DC. I left that meeting energized and made so many wonderful connections that would dramatically affect my life in 2010. I met Chai Shenoy and Shannon Lynberg with Hollaback DC. They would inform me of the dangerous impact of sexual harassment on the citizens of DC. I would agree to work with them on a mural project, and at this point we are waiting for a wall on which to paint our vision. I would present with them at a Chispa event and blog talk radio. I would meet Joni Podschun and Greg Bloom with the Save Our Safety Net campaign. They would invite me at attend city council meetings to show support for keeping city services intact for our poorest citizens. 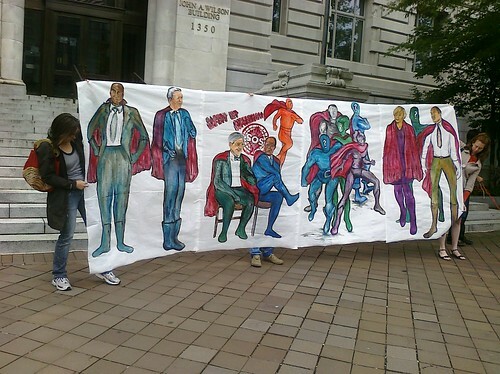 They created a branding campaign where our council leaders who supported the safety net were depicted as super heroes. So I painted a large banner for them of all the council members who had supported the concept. We then stood arm in arm around the Wilson Building supporting the safety net and holding up the banner. Due to my work with Greg and Joni, I would talk with Lance Kramer, who would ask me to work on the healthy food in DC schools campaign. Lance and I came up with a great arts action but would not get to complete it due to a city council decision, but Lance would contact me over the summer to place a show of my advocacy art in the local coffee shop Modern Times in the Politics and Prose bookstore. I met Eric Sheptock at Social Justice Camp. He was recently profiled in The Washington Post, and would learn firsthand of his homeless advocacy while being himself homeless. He would become a good friend on Facebook and would inspire me to host several events at my church St. Paul’s, that would fund our homeless shelter and homeless causes in DC. In February, I would begin working with the 6th, 7th and 8th grade artists at Deal Middle School on a series of six social justice murals. I would get to talk and work with fifty youths as they focused on, discussed, and then painted about social justice issues throughout the globe. 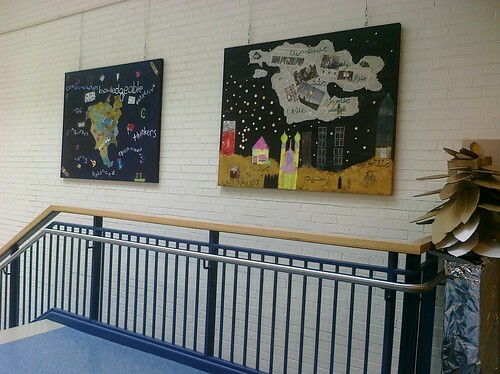 These six paintings are on permanent display at the school. They look so pretty when you just glance at them, but if you take a moment and truly look at them, you can see the sadness they convey. I would meet Amanda Jones from Out of The Boat Ministries, and she would alert me to the homeless youth who must couch surf from home to home as they do not have a safe place to live. 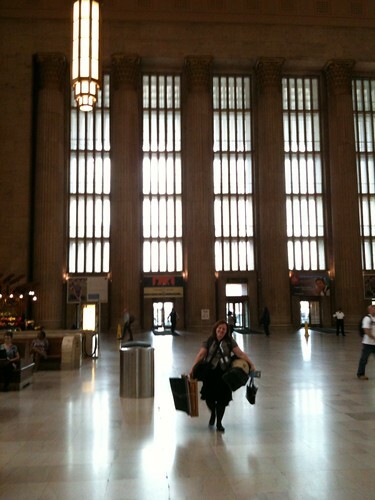 Then during the blizzard in February, I would see a tweet from Amanda saying that she would need a place to stay once she came home via Union Station as none of the over-ground Metro stations were working. I replied that I was only five blocks from Van Ness/UDC, so she trudged over four foot drifts to come to spend the night. She played for hours with Isaac and filled our house with joy as she couch-surfed into our lives. 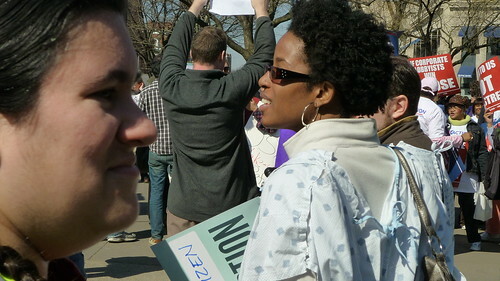 In March, she would rally with me for patient’s rights. 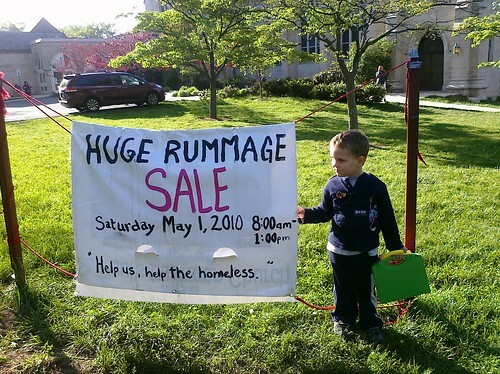 In May, she would come back to help me run a rummage sale at St. Paul’s Lutheran to help homeless ministries. I would meet Ben Merrion who works with the non-profit DC Learns adult literacy outreach at MLK Library. I would find out that Ben was on the board of Hollaback DC. Ben too would rally with me in March for patients' rights. He would also attend my gallery show at Clinovations in July even though it meant missing a church choir practice. I would find out that in addition to being an activist, he was as geeky as the rest of my friends and family. He would come over and watch long Doctor Who marathons with Will Kemp, Michael Wenthe, Rebecca Boggs, and our little family. He helped bring back joy and laughter to my boys and me, and I can happily say that we both have Facebook profiles that state we are in a relationship. I think of the "trouble" we can cause together. So, I can rightly say Social Justice Camp rocked my world. I made so many contacts that opened my eyes and sent me into new directions of thought. So, I would like all my health friends to meet all my activist friends so we can create some great ripples together. That is why I have teamed up with Social Justice Camp. I would like to throw a stone in the water and watch the ripples grow. I would like to see what happens when we get such amazing people together and create an intricate web. I hope you can join me…. You can register to attend at here. I have told you before that as a child I worked at a local flea market in Sapulpa, Oklahoma. It was hard, dirty work, and it made me despise at a very young age any passing fad or craze. You see, every couple years after a fad died the over-abundance of certain products would crowd our stall and be almost impossible to sell. I, to this day, cannot stand termite shoes, Rubik’s cubes or feather earrings. But I truly disliked the many mugs, wall hangings, and decorative pillows emblazoned with the words to “Footprints in the Sand.” As a child, I found distasteful the hokey 1970's imagery of the beach sand and the disappearing footprints next to text written in mass-produced faux calligraphy. I am sure you are familiar with the tale. In it a man walks with God along a beach as the memories of his life pass him by. He notices in his darkest times there is only one set of footprints. He questions God, “Why did you leave me at my saddest moments?” God responds that when there was only one set of footprints that was when God carried him. Now, I am often asked "How do you do all that you do? How do you have the energy to balance teaching art, advocacy, blogging, giving speeches, and painting?" Well, I do not do walk alone. I pray, and God gives me the energy to sustain this life. I remember one point when Fred was in the hospital, when all things within this life seemed so very dark. I remember praying for the peace of God, that it fill me and uplift me. And it did. I remember the moment. I was walking through the hospital cafeteria praying silently when I was filled with the love and light of God. My face was lit with an inner peace and even the hospital workers remarked upon my visage. The footprints artist had gotten it all wrong: when God carries you, you float. Time has passed, and I no longer burn with this inner fire. I smolder. The journey is long, and I know the spirit is still within. I listen carefully and watch for “God moments.” My sister Esther and I call those moments of divine direction that happen with our lives “God moments.” I listen, I am open to direction, and I know the freedom of putting one’s life in God’s hands. 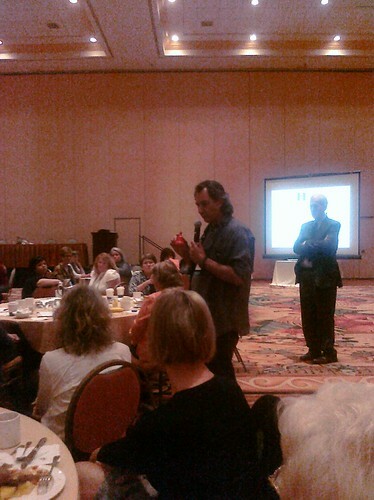 So when I was invited to speak at 2010 CMS QualityNet Conference on December 2 in Baltimore, I said yes. And that is how I met Chuck Denham. Do you know Dr. Charles Denham? He is an amazing man. He worked with many cancer patients over the years as he has a background in oncology. He is founder and Chairman of TMIT (Texas Medical Institute of Technology), a non profit driving adoption of patient safety solutions and in this capacity he teamed up with CareFusion and AORN (Association of periOperative Registered Nurses) to produce “Chasing Zero” for the Discovery Channel. “Chasing Zero” first aired in April of 2010. It stars Dennis Quaid in his new real-life role as a patient’s rights advocate. It is a very strong documentary about patient safety, and it made quite a splash in the world healthcare and patient advocacy. I had seen parts of it before meeting Chuck. I knew about the reason why Dennis Quaid was acting as a spokesman for patient safety as well. I had seen a repeat of his March 2009 appearance on Oprah while Fred was sick in the hospital. I heard him speak about the fateful overdose of his young twins due to a case of look-a-like bottles of blood thinner. The twins were mistakenly given a dose from a 10,000-unit bottle instead of a ten-unit bottle… and it happened twice. The twins did live, but this acted as a wake up call for Dennis, and he decided to help so others would not have to suffer as his family did. Dennis Quaid’s inclusion helped a strong documentary become a must-watch call to action. Chuck asked me how I had gotten invited to CMS. I couldn’t tell him at that moment as I had forgotten the complete course of events, but now I see clearly. I spoke before CMS, because on Sunday, May 3, 2009 I worked at Barstons Child’s Play- the toy store. I only worked at the toy store for three days when Fred was sick, and one of those days was May 3. Fifteen minutes before the store closed, Christine Kraft, a long time customer, came in, and I told her about Fred and kidney cancer, and she told me about Twitter, blogging, Health 2.0,and ePatient Dave. After Fred entered hospice, Christine put together a small Health 2.0 get together on May 27, 2009. 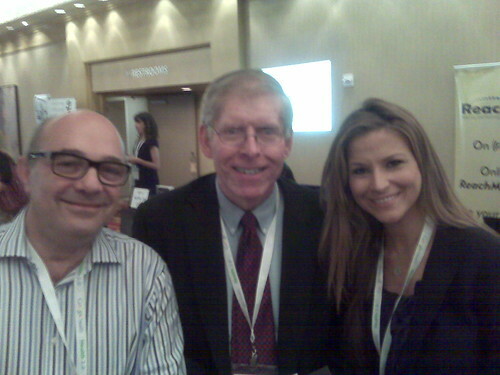 That day I met Ted Eytan, MD. I would later find out he worked at Clinovations in DC and he would introduce me to Greg Fuller who would pitch patient participation at CMS on November 8. Greg would give them my name. So on December 2, I spoke before CMS about Fred, patients’ rights, Stephen King, social media, special education, and Cub Scouts. 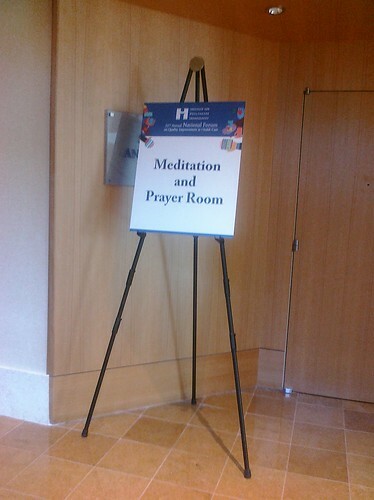 I would tell them that putting the “H” in HIT requires remembering… Holliday, Fred; not the patient in room 6218. After I finished, a slow standing ovation spread through the room. Then Chuck Denham can over to speak with me about how he would like to spread this message far and wide. We spoke briefly, and when he learned we would both be at IHI on December 5, he asked me to film a small piece we could send to clinicians about why it is so very important that patients and caregivers have access to the electronic medical record. Then Chuck did something very few people have ever done. He asked me how I was feeling, and he really listened to my answer. I told him that when I paint or speak I go into that gray, sad place, and I walk in darkness for a while, but I come back renewed and refreshed. Chuck told me he has worked with many advocates, and he is concerned. He is concerned about our continual revisiting our deepest sadness, just so we can tell our tale to others. He worries about us and wants help us. So when we were filming on December 5, he asked what is it that helps me and inspires me and what supports me in my sorrow? I looked him in the eye, and I said God does. So Dr. Charles Denham did something that no other doctor has ever done with me. In all the hospitals we stayed in, no doctor ever reached out and prayed with me. So, I sat there with Chuck and we prayed, and once again, I felt that wonderful peace of God. 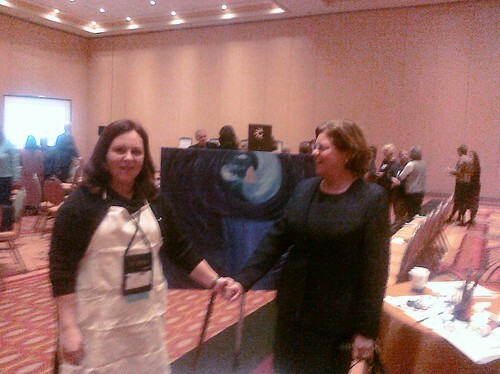 “Patient Centered Care” as shown above is in progress on the 5th of December, 2010 at IHI Conference in Orlando, Florida. I paint about health data. 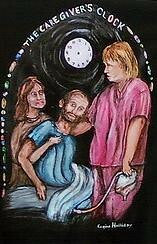 I paint about patient stories and better healthcare practices. I paint about these concepts on public walls by city streets or on the backs of business jackets of healthcare advocates as they attend medical conferences. 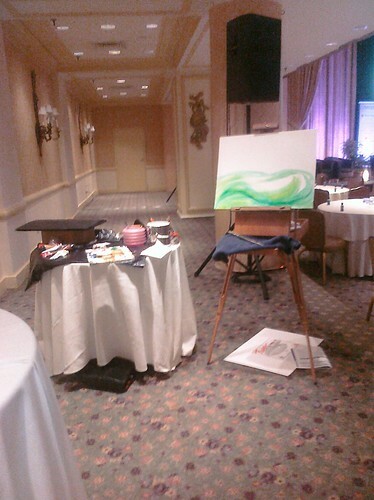 And sometimes I paint on canvases in the middle of a conference. When I paint onsite, I listen carefully to that which is said and incorporate the spoken meme as well as the twitter feed into the painting. 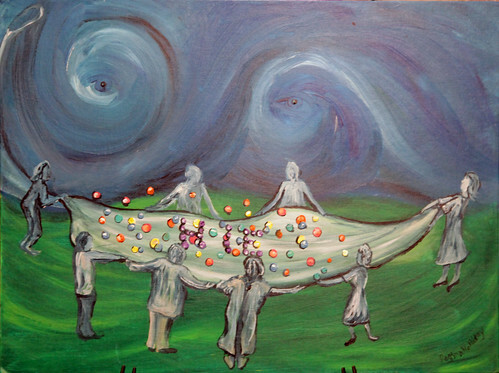 This painting is “Patient Centered Care” and I painted this at IHI (Institute for Healthcare Improvement) during the Patient Activist Summit and during two mini sessions on Health IT, Meaningful Use and Patient Data. 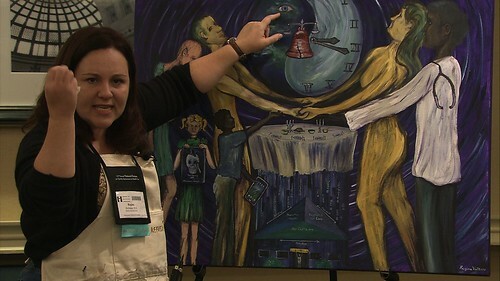 If you look closely at this painting you see the background is the deep purple outline of the IHI logo. As the patient summit began the power point display was one slide. That slide was the IHI Logo. It loomed large above us as each activist introduced himself or herself. There were 50 or so activists and they were supposed to introduce themselves with a Twitter intro, keep it short only 140 characters. Not many were on Twitter so perhaps they misunderstood as they spoke too long during introductions. Perhaps they understood perfectly well, but after being in situations where no one listened while they or their loved ones where medically harmed, they were desperate for the chance to talk. So the “I” in the painting began to radiate circular waves of communication like a radio tower set to transmit. So we spoke, some tweeted and I painted. I stepped back and listened to the patients and clinicians in the room who were willing to grasp hands and support the changing world of healthcare. So within the painting stand two beings. One is male and one is female and they are golden and seem almost holy and they clasp arms to support the world above them. On the right side of the golden female figure, a doctor stands. He is serene. His hand is placed under the golden women’s arm supporting her and joining in her effort. To the left, a young boy supports the arm of the golden male figure. 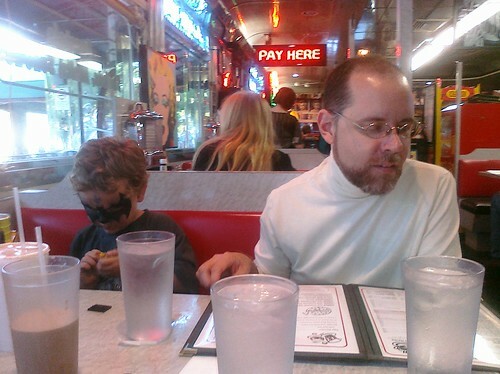 In his other hand he holds an I-pad as this is the way the child communicates within his world. Both the boy and the doctor are people of color. Their inclusion is viewed as instrumental in creating balance within healthcare. Though they are on opposites sides of the canvas, they are the same person at different stages in one life. To the far left, a suffering cancer patient leans on the shoulder of the golden male figure. Her gown back is gaping, but she is far beyond caring about this embarrassment, as she is deep within the final stages of her disease. She is leaning on the system for support and has no more energy to give. In front of her stands a child. This girl holds a children’s book about Phineas Gage. Do you know about Phineas Gage? He was a man who lived in the nineteenth century and had a metal rod driven through his brain. His story- the patient story- greatly affected the thinking of the times in regards to personality and the lobes of the brain. The child knows this story, she has read it in a children’s book. She knows about the power of stories. The world in the center of the painting is the dot of the “I.” It is forms a yin and yang symbol within IHI where we are struggling to find balance. On the left side of the world North America is represented because that is where IHI began. An eye looks upon you from the continent. It is looking at you, demanding you use vision in creating better care. To the right side is a clock. The numerals are in Latin and the choice to depict time in ancient increments represents the current lack of clear communication and a reliance on old antiquated systems within many medical institutions. Both the hour hand and minute hand point to three ‘o’clock as we try to support the “triple-aim.” The clock itself represents an oft-heard clarion call of the activist: the time for change is now. In the center of the world clock resides a call bell. Bart Windrum brought this bell so each activist could ring it after recounting his or her tale. It reminds us of to the old call bells patients used before modern technology introduced the silent, efficient and sometimes ignored call button. This bell is red and it represents warning. It is also a Liberty Bell and emblazoned upon it are the words “Information Liberty.” Above and connected to the bell are the scales of justice and they too point to the desperate need for balance between the provider and the patient. Below the world is a table set to explain why clinicians need to consider EMR adoption. This element is based on the talk given by Ann Lefebvre, called “Integrating Health IT into a Statewide QI Program.” She mentioned that they invite their clinicians to discuss systems and EMR’s four times a year. So the table is set with plates saying things like EMR and HIT. The two candelabras at the table light the surroundings but they also contain the symbols of money and percentages. Often these kinds of talks can be more about incentives and dry data bytes and less about the actual patient outcomes. Below the table is the Twitter feed for the conference and that pours into the patient centered medical home. The roof of this house is the IHI triple aim: population health, experience of care and per capita cost. The Cub Scout character connection of know, commit and practice surrounds it. I threw that in as I am a Den Leader and know that change only happens when you promise to do your best and you keep your promise. At the door of the home stands a very small patient. 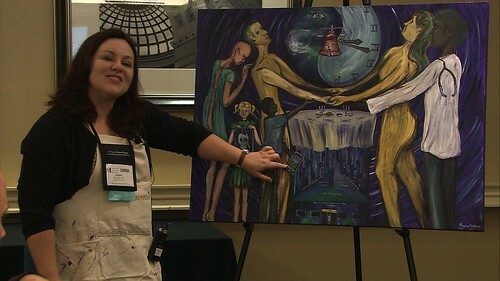 Patient centered care was discussed in an in depth fashion by Laura Adams, J. Robson and Jaquelyn S. Hunt during “Whose care is it anyway…and Can Health IT Help.” The patient is holding up a ruler and trying very hard to be centered, but if you look closely, you see the center of the painting and the home is slightly off kilter. This lack of center exists in the painting because that is the current experience in US health care. But there is hope. Due to the work of the folks from IHI and Patient Activists and Clinicians we have hope of attaining balance, and making this vision of the future a reality. The finished piece can be viewed here. I hope you get a chance to look at it. This photo was taken right before I addressed the room about our family story and the meaning of the painting. I was not on the agenda that day, but the speakers were so gracious as to ask me to present. I told them about the very personal reason I advocate and I explained the painting. The entire room of attendee's to the session "Who's Care is it any way...." gathered around the painting. You will see me in the middle, slightly left of center. I suppose that is a good place to be as we strive toward patient centered care. I am very honored to post a guest post on this blog. This post was written by Alisa Gilbert. This past summer, my best friend lost her grandmother to old age. She died a few days before her ninety-third birthday. She had suffered a serious stroke the winter before, and had been shifted from her nursing home to hospice care later that spring. A team of caregivers rotated through their shifts to care for her, to change her bedding and diapers, to feed her and make her as comfortable as possible, in what I used to think of as a simple, perhaps distant activity. Now I understand that much more can come of proper care-giving. Towards the end, after her grandmother had suffered a series of minor strokes, my friend described how they used a miniature vacuum to clear mucus from her mouth. I had never understood the emotional and physical toll that hospice care can have upon everyone involved—the staff, the patient, and the family members—until I had to comfort my friend through that tough half of the year. Each day she returned from visiting her grandmother, I heard stories of one specific caregiver, Mary, who seemed to have taken her job and utterly transformed it into a lifelong calling. My friend's family had dealt with other caregivers that seemed less interested, a pair of which had quit in the final days because they decided they'd be better off looking for more work, so to hear the talk of Mary seemed encouraging despite the sadness of the situation. One day that final month my friend asked me to visit her grandmother with her, so I steeled my nerves and went along. Besides I wanted to meet Mary. When we entered the room, we were greeted by a short, middle-aged woman with brown hair and tears in her eyes. She immediately hugged my friend, and then hugged me, after which I was introduced. Mary gave us an update on the day, all of its tiny particulars, and then my friend sat by her grandmother. Mary gave us a moment alone, and when she returned, my friend left to use the restroom, so I was alone with Mary and my friend's sleeping grandmother. Mary made small talk with me for several minutes, and then I watched as she quietly reached over to my friend's grandmother and with a cloth gently wiped at the corner of her mouth. I understand that this is not necessarily a unique gesture, but it still struck me for the power I felt in the room. I will never forget the way Mary sort of filled the room with her emotions that day. She struck me as the kind of person who had a deep, deep respect for both her patients and the family members of her patients. I'm not sure I have ever witnessed in someone a sympathy for others as strong as hers. In a way, her example, the way she acted in that little hospice room made me rethink how I consider those who are sick and those who take care of them, and the warm connections that can exist between them. In the summer of 1976, I was four years old. This was the summer Americans were told to go on the road and rediscover America. Our family followed the national advice and began a road trip that would take us from Oklahoma to Kansas, Missouri, Nebraska, Colorado and New Mexico. It was a magical time. We piled into our brand new ’76 Chevy Impala and tasted the freedom of the road. Even though I was only four at the time, two experiences were seared within my mind during those kodachrome brilliant hot summer days. While in Colorado we visited an amazing amusement park called Santa’s Workshop. 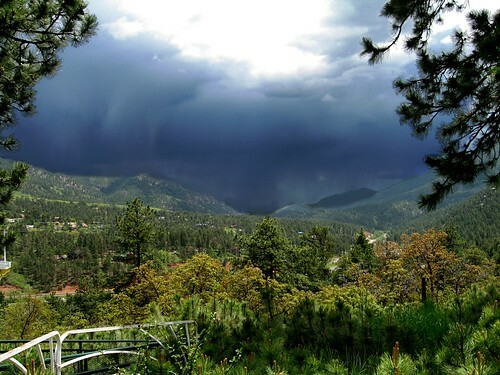 Ten miles west of Colorado Springs, they have North Pole experience complete with a Candy Cane slide and the tallest Ferris wheel in the world. I will never forget the moment I rode that wheel. My family peered up at the huge ferris wheel that was built upon a mountain at a 7,500-foot altitude. The wheel operator dared us to ride the enormous structure. My mother chuckled and said she would not, my father laughed as well. I stepped forward. I said I would like to ride. The carny asked if I was sure. Did I really want to ride all by myself? I nodded yes, and was lifted up into the seat. The carny man pulled down the restraining bar that floated eight inches above my legs. I looked around to see, and found I was one of very few people who had attempted the ride. As my seat rose ever higher, my knuckles whitened around the restraining bar. I realized how easily I could fall. I looked at the great space between my legs and the bar and stared at my little fingers pressed so tightly on the cool metal. I looked down at my scuffed canvas shoes as they dangled so many feet above the crowds. As I reached the pinnacle of the ascent, I looked down so far below at my small family. At that moment, I felt so proud, so strong; I alone had braved the ride. I was filled with fear but I would not let it panic or conquer me. I was so glad that I got to do this. I cherished the moment and the trust my parents had in me, that even though I was only four, I could be brave. I was joyous and I was on top of the world. That was an empowering experience. I floated bravely above for a few moments, but most of life is lived upon the ground. It is just as important to find empowering events within one’s daily life. So my other amazing experience of the summer of 1976 would be considered a boring reality to many, but I still remember and cherish the opportunity to get ice from the motel ice machine. To this day I cannot pass a hotel ice machine without smiling. Have you ever noticed as an adult you must crouch down slightly to get ice from these machines? I have often thought they were designed with a child’s height in mind. When I was four, many privileges and responsiblties were literally out-of-reach. I could not reach the sink to wash dishes or get a drink. I could not reach the dishes in the cabinets to set the table. But as we stayed in hotels, I began to relish my new duty of getting ice. I would take the ice bucket and would run down the hall to the ice machine. I would listen to its calming motor hum, as I would place the bucket on the lever. The rattling clunks would echo inside the machine, as the motor would gear up. The hole above the lever would begin to spew the mounds of ice into the bucket. Hotel after hotel, I would do this ritual and I discovered there were many types of ice. In some motels it would come out as cubes, sometimes it would be frozen rounded discs and sometimes wedge shaped smiles. By far, my favorite ice was the donut type. This ice would cascade out in circles. My sister, my brother and I would eat this ice like it was popcorn. I loved the way it would roll within my mouth. I loved the delightful chill of slipping my tongue inside the hole within the ice. I would press my tongue until eventually the ice would turn thin and sharp, and then I would crunch my teeth upon the shards. I loved chewing ice, but even more I loved the ability to get that ice myself. So the child I was became the wife that stood in front of other ice machines. Pastel pitchers had replaced the old plastic bucket. I had lived much in the 33 years between hotel ice machines and hospital ice machines. I had married, given birth, managed stores and was well acquainted with both responsibility and privilege. So as I begged for access to information and asked how I could help my husband, I was handed a plastic pitcher and given the one duty I could be trusted with. I could get him ice water. Each day, many times a day, I would get Fred ice. I would leave the room and carry that little pitcher down the hall and fill it up again and again. I grew concerned as time past that the facilities did not replace nor clean the pitcher. In the first hospital we had the same pitcher for two weeks before it crashed upon the floor and shattered. It was then replaced. Fred went for another two weeks with his second pitcher. It was a mauve pink pitcher and I took it home upon discharge. (It became my water bucket while painting 73 Cents.) 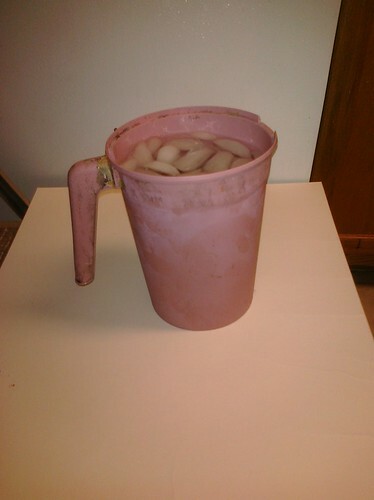 At the second facility, Fred again was given a plastic pitcher. After a week of using it, I came to the hospital one morning to find a black substance inside the bottom of the pitcher. I showed it to the nursing supervisor, she alerted other floors about the potential for patient harm. While Fred was hospitalized, we saw that facility take steps to discontinue use of the re-useable, yet never washed, plastic pitcher. So as Fred grew more ill, I often thought of ice and ice machines. The first thing I would do each day was to get him ice. The last task before leaving his room was to check and see if his pitcher was still filled. It made me sad. Sometimes I too, would drink the water and chew the ice. I would think of the ice I sucked upon while I labored before the birth of our two sons. I would think of the happy anxious father who would eagerly go down the hall to get me ice chips. He was so nervous he practically bounded down the hall. I chucked through the pain of childbirth, upon seeing his behavior, but at least that duty made him feel useful. I feel grateful that you are writing this blog. Our inefficient health care system manages to stay this way because patients and families, at the moment when they are most vulnerable, have to spend their emotional resources dealing with unilateral and arbitrary decisions of hospital administrators, insurance companies, and doctors. And that is how we lose our energies to fight for change. But seeing that you and others who went through a terrible experience are not giving up, gives us all some hope and inspiration to fight. Thank you! That is how I met Yuval Sheer. He lives in New York and writes a wonderful blog that reflects upon life and art and, of course, chewing ice. In the classic sense of knowing someone by meeting him in person, I suppose we have yet to meet. I feel as though I know ice chewer through his quirky writing, interesting photos and the amazing artistic interpretations of created by his dear Mettookonet. The ice chewer has posted comments on my blog 10 times and we also touch base on Twitter. 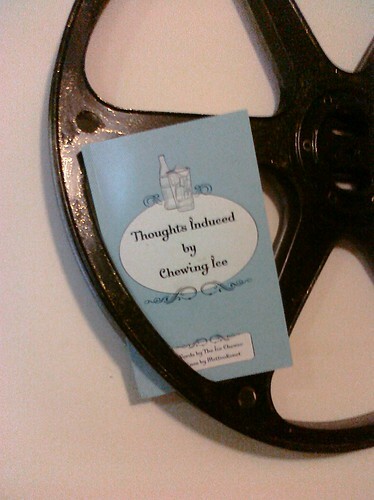 In July, I was honored to receive a precious copy of his limited edition book: “Thoughts Induced by Chewing Ice.” It is filled with many posts of wisdom and makes me wish I could be far wittier than I am. The ice chewer writes with wit and humor as he chews on cold ice. I blog of pop culture, health and my family with deep emotion and often hot tears. We both use photos and art frequently to make points within our posts. I love this statement. It is not enough to only paint. There are many types of artists and art, just as there are many types of ice. It is the thoughts induced by chewing ice and art that lead to innovation. Those thoughts can lead to change, to action. They can create a new hospital policy. They can lead to a change in national laws and they come from a willingness to share and contribute to the whole. Thank you so much Yuval Sheer for sharing your thoughts with me. 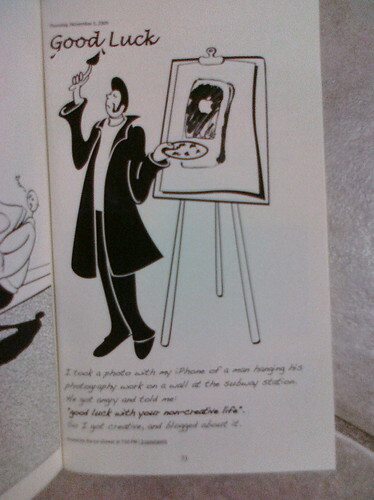 Thanks for placing a picture of an artist on the 73rd page of your book. The story matters, whether it written on 73 pages or paid for with 73 cents. I am glad I can share that story. I am glad I can bring it all to the table and present the patient voice. Little girls who ride Ferris Wheels can grow up to be brave women who climb high ladders and share sorrows for the entire world to see. Those women can meet brave men who share their vision and realize that every event and every person is important. These are the thoughts induced by chewing ice. I wrote about an ice burg and he found me. In darkness, I swam upon the sea of data. on a cold December day. And met he who chews the ice. Did I ever mention Fred was for the most part a stay-at-home dad? Yes, he was an adjunct at three universities and worked part-time at the video store, but otherwise he was with the children. When Isaac was a baby and Fred would have to wile the hours away taking care of an infant, he would often strap Isaac into a front-pact baby carrier and go to Politics and Prose. Politics and Prose was Fred’s favorite store. He would spend hours there. As Isaac grew, Fred would place him first in the backpack, and as time passed, the stroller, and off they would go to Politics and Prose and divide their time between the film section and the mouse hole in the children’s section. This was Fred and Isaac’s routine for three years. Then in March 2009 Fred became ill. Fred could no longer visit bookstores. I would bring books to him instead. On his birthday, I brought him three books from P&P, and due to his intense pain and his pain medication, he would never finish one of them. When Fred died in June, we received many letters of sympathy, but one letter I treasure the most came from a P&P bookstore employee. She said how sorry she was that we had lost Fred and recounted all the many times Fred had carried Isaac in her store. I had had no idea that they had spent so much time within the store. While little Freddie was in school and while I worked, Fred and Isaac were surrounded by a maze books in a room filled with a love of knowledge. 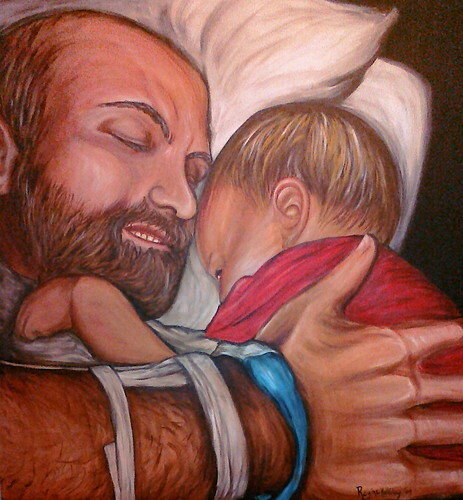 My eyes filled with tears as read of this vision of a father and son. While painting the mural 73 cents in July, many staff members came to speak to me about the painting. Even the co-owner Barbara came out a few times to talk about medicine and paint. 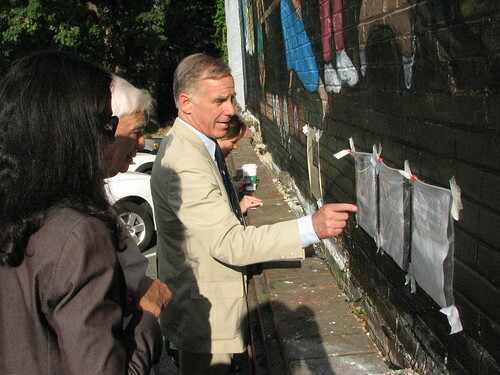 When Howard Dean had a book signing at Politics and Prose, he came out to see the mural with one of my friends. When I tell people how to get to the mural 73 cents, I often say you can’t miss it. It is right by Politics and Prose. So you can image how happy I was to be invited to show my canvas work at Politics and Prose later this month. The canvas work I have done will be displayed in the coffee shop in the basement of P&P from November 19, 2010- January 5, 2011. The opening reception will be Monday, November 22 from 5:00-7:00 pm. I will be showing many pieces about our personal struggle for information during Fred’s cancer journey. I will also show some pieces that comment on social media, open government and Meaningful Use. I hope you can make it. I am glad I will see Fred’s face again inside of P&P, or as my little Isaac calls the store: Daddy’s Library. 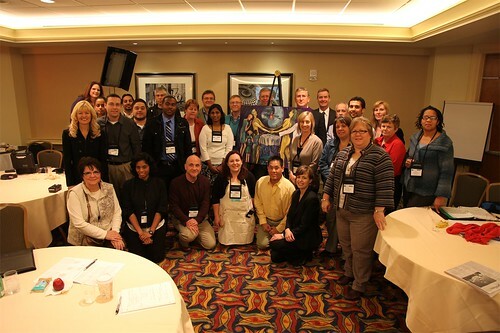 I recently attended the Kaiser Permanente Executive Leadership Conference in Washington, DC. KP leaders gathered from all over the US for this event. At the opening of the meeting, KP showed a compilation of several videos to present my art advocacy mission supporting patient access to the medical record and the painting 73 Cents. It was a very powerful video, and after watching it, several members of the audience came up to talk to me about … my hair color. I am one those people blessed to have been every hair color. I was born with a thick head of black hair. In a month or so, it fell out and came in blond. As I grew, my hair turned red and was that color for many years. By the age of 8, my hair was light brown. In my teens, my hair turned to a dark brown. With having such an amazing array of colors in my youth, I found I didn’t feel constrained to any one color, and in my twenties, I decided to lighten my hair back to the red of my childhood. When Fred grew ill, I was still the light red I had been for many years. After Fred died and I began my painting advocacy, I continued to keep my hair a light red. While working on 73 Cents, I spent days painting in the bright sun, which bleached my hair even lighter. As the months of painting and grief progressed, I looked at my roots coming in completely gray. I now could truly say I had had every color of hair. But I am only 38 and do not plan to go gently in that gray night. So I went to a local salon for a color consultation. The nice stylists there told me I should go darker as it would look nicer with my complexion. I submitted to their excellent advice. While I sat in the chair, I spoke to the stylist about hair and cancer. I told her about my husband’s 10-week hospitalization. After about six weeks, his hair had grown so long. We inquired about barber services. The hospital informed us there was a nice lady who performed haircuts for patients. She was very nice, but she did not have a lot of skill with cutting the hair of a bedridden patient. The entire experience turned into a farce that Fred, his folks, and I shared with friends for weeks to come. So I am not bothered that the most asked question after viewing a video of 73 Cents was about my hair. I know often when we talk of hair, we might also be talking about beauty and death. Perhaps I have gone darker … because I have gone darker. Like Dark Willow or Dark Phoenix, I am not the same as when I started. I brought two portfolios with me to the KP conference. One is light and cheery; it is my "before" album. For so many people ask if I was always an artist; I have always been an artist. I used to paint book characters and children's bedroom murals. The before portfolio shows the work I have done with children for the past eight years. 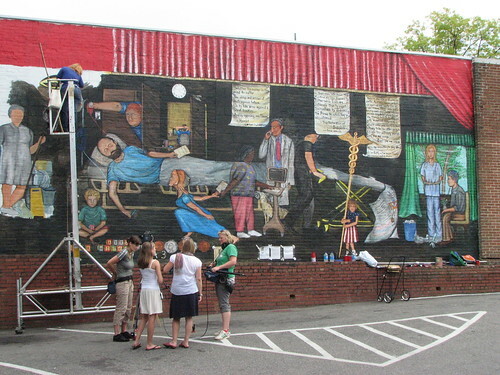 The "after" portfolio is for the Medical Advocacy Mural Project. It is filled with images that often disturb but still retain hope. I like to create images that make you think, even if they tend to cause upset. This portfolio is darker, but there are still windows of light. 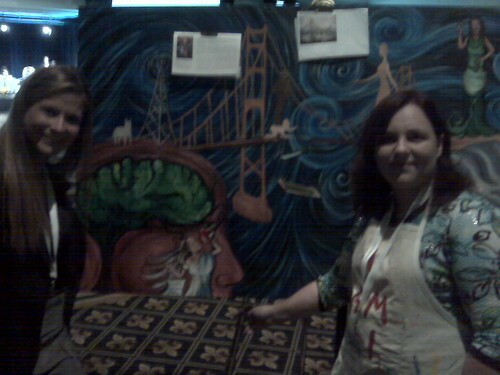 This portfolio contains medical murals, jackets with patient images, and canvases I paint on-site at conferences. Recently at Health 2.0 in San Francisco, I met a very beautiful woman named Diem Brown, and I painted her sadness. Diem was only 23 when she was diagnosed with ovarian cancer. She found herself adrift with no one to ask for help. Wedding and baby shower invitations were arriving in the mail while Diem was struggling to pay for chemotherapy wigs and to arrange drivers to her various medical appointments. She thought, “Why is this so hard? Why isn’t there a registry for cancer sufferers like those that exist for brides?” Due to Diem’s valiant effort such registry exists now, and it is called MedGift. 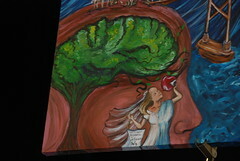 Her story touched me so that I painted it into the Health 2.0 painting Bridging the Great Divide. 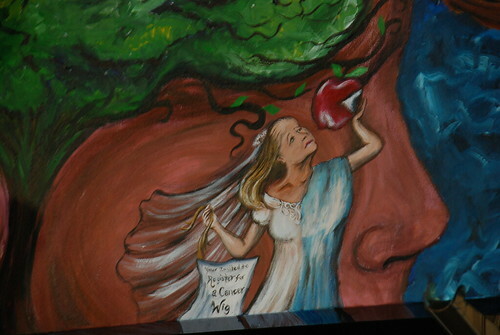 In this part of that painting, the bride is combined with the cancer patient. The best point in her life is combined with the worst. The sorrow is palpable. The cancer bride's hair is falling out, and strands are held in her hand. She is reaching for the apple of knowledge. In that apple is placed an eye. Knowledge without vision helps no one. Weeks after I painted this, I was sent the wedding photos of Katie Kirkpatrick. If you have never seen these photos, I recommend you take a moment to view them. Katie was suffering from end stage cancer when she married her high school sweetheart. Under her lovely gown her limbs were swelling as her organs began to shut down. Just glancing at the photos made me cry, as I saw a body so similar to Fred’s before his death. She was dying and she was beautiful and … her hair was so pretty. She died five days after her wedding. Thank you, Diem, for sharing your vision with us all. I am sure there are many people who will thank you for creating MedGift to help them when things seem their worst. Thank you, Katie, for sharing photos of your happiest day while so sick; we shall never forget you. And thanks to the folks at the Kaiser Permantente who were brave enough to invite a cancer widow to an executive conference to remind us ...we are all patients in the end. When I young, I was a very good student at Sapulpa High School, but I was twice sent to the principal’s office. I was sent once for health and once for comedy. I was a journalist for the high school newspaper and was looking for a story. The student body had recently completed a survey wellness check. I found out the school office had a copy of the results. I wrote an article reporting the findings. The statistics I mentioned included drug use, alcohol use and sexual promiscuity within the school. After turning in my story, I received a summons from the principal. The school paper would not print my story. I wondered aloud if I had made a mistake in my fact checking. The answer was no--they just did not want me to expose the results of the wellness check. Later in the year, I wrote and directed the senior assembly, including the skits. I was called to the office yet again, as some of the skits contained a comedic analysis of the school that was a bit too scathing. I was ordered to revise the skits and make them “nice.” I to some extent complied, although a little of the original biting humor remained. I was tired of being called to the principal’s office. I thought it was rather ironic that it was called the principal's office, as I found my principles tended to get trampled there. I had found that using humor and art I could often make a point that would never be allowed in the more mainstream press. I guess that is one of the reasons I spent over 10 years watching The Daily Show on Comedy Central. I liked the show, and Fred loved it. If all clinical services were equal, would you decide which hospital to stay in based on whether or not they had Comedy Central? Fred would have. He stayed at five hospitals during his eleven weeks of care, and only a few offered this on their basic cable menu. Fred loved the program The Daily Show with Jon Stewart and its spin-off The Colbert Report. Fred and I started watching this as our nightly news in 1996. Back then it was hosted by the very handsome and blond Craig Kilborn. I thought his very visage was in itself a joke about whom we choose as an anchorperson in this country. He was a very pretty talking head spouting humorous nonsense. In January of 1999, Jon Stewart took over at the helm. Fred already loved Jon Stewart’s comedy work and was very impressed by this new shift in leadership. I was not an instant fan. The show seemed to get a bit more serious and the humor had more of a bite to it. This was now a thinking man’s farce and Fred would often use the Internet to do further research as stories on the show piqued his interest. We watched The Daily Show together for years and in 2005 began watching the spin-off show as one half of “Even Stevphen.” Stephen Colbert created The Colbert Report. In time, I was won over by the program and began appreciating the biting satire that both shows used to lampoon political parties, world leaders, and the hapless celebrity. But I was most impressed by Jon Stewart’s autism benefit of 2008; as he asked for donations from the audience so few people raised their hands. You could see outrage on his face as he pledged to donate in front of a crowd who had far much more money but less heart. That day I began to love Jon Stewart, because it is all a joke…. until it is not. 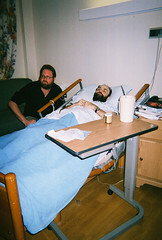 In March 2009, Fred was hospitalized. There were many problems with communication at our first hospital, but at least they had Comedy Central available on their cable menu. When we transferred with an out of date and incomplete medical record to a new hospital. Fred was saddened to see that there was no Daily Show to help ease his pain. But at least this hospital had WIFI, so I was able to upgrade our old laptop so Fred could see past shows via the Internet and surf the web. As I have said before, there are many ways of relieving pain. A few weeks later, Fred was transferred to rehab. At this facility there was no Comedy Central and no WIFI. After spending a few weeks suffering incredible pain in the rehab facility, the decision was made to enter hospice. Fred was crashing. Upon entering hospice, Fred was not eating, drinking, or talking. In 24 hours he rallied under the good care of the hospice team. He was able to talk with friends and family and watch The Daily Show again. A few weeks later Fred came home for hospice care. It was a very hard time. I was trying to balance caring for my husband with caring for the kids, while Fred’s mother helped as best as she could. It was very hard, but each night we would hold hands and watch The Daily Show. Here we come back to the title of this post. In the early morning of June 17th, around 1:00 am Fred could not sleep. He was having such trouble breathing. I turned on the TV, and holding hands, we watched the late night repeat of The Daily Show and The Colbert Report. I don’t really know what they spoke about. I was listening to each breath Fred took and trying to ease his pain. I don’t know if it was funny. But I know Fred was happy to see a show he loved and hold his wife’s hand as he lay dying. Fred said his last words at around 6:00am, and by late morning he died. When Fred had less than twelve hours to live, he spent one hour watching Jon Stewart and Stephen Colbert. So this weekend, I will be attending Jon Stewart’s Rally to Restore Sanity/ Stephen Colbert’s March to Keep Fear Alive. In a way, I am sure Fred will be with me. It is being billed as the Million Moderate March. This is where all the regular people who do not attend marches can be counted. I will be there as the wife and mother and fan of the show. I will also attend as the activist I have become. Because sometimes things seem like a joke until they are not. I am glad. I am sure there is another Fred out there who laughing with The Daily Show as the morphine pump provides its gentle comfort. I wonder though, which pain relief is impacting the patient more? Have you ever seen me paint in public? I am usually covered in drops and splotches of paint. My hair is a wild, wind-blown mess. My rolling shopping cart is parked beside me filled with brushes and the accoutrements of my craft. When carrying my supplies to the job site, I seem weighed down with the weight of the world, and strangers on the street often assume I am homeless. My canvas is usually a public wall on a city street. I paint beside grit and litter and a faint aroma of urine. What I paint is not always pretty, and neither are my surroundings. I take in this ambiance and a vision from my soul, and I smear them on a wall for all to see. I have been thinking quite a bit about the child’s eye view of medicine and information technology in recent days. I have been especially focusing on the view of the child with special needs and autism. A few months ago, Kevin Kruse invited me to speak at his conference e-Patients Connections. I knew of Kevin through his Twitter presence but also through his sister, whom I met through Twitter and Facebook. 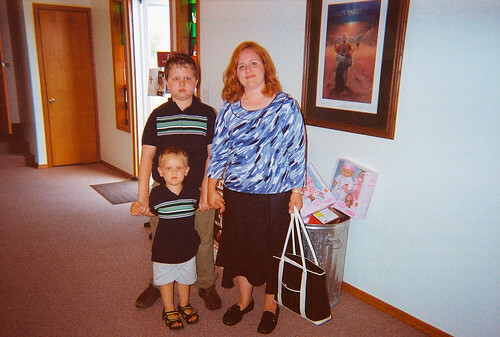 Kevin’s sister, Diana Kruse Sebzda, is an amazing thinker and writer on grief. We have talked on the phone about grief and social media, and she is a great friend. So when Kevin contacted me about speaking, I was already primed to say yes. But Kevin took it a step further and asked me to paint on site as well. He then proposed that we auction off the work to raise money for a charity of my choice. I knew at that moment what charity I would support and what would be the body of my speech. I would support the Ivymount School Model Asberger Program as my husband did, and I would speak of our son Freddie. Do you know the wishes of your loved ones? Have you ever taken that advance directive conversation a step further and found out the in lieu of flowers of your partner/parent/child? I vividly remember sitting at my husband’s side and speaking about pallbearers and which memorial charity would Fred choose. He chose Ivymount. He picked the school that helped our son and held his broken heart within their open hands. He picked the school that counseled and guided a child through the worst moments in his life and provided such solace in a time of great anguish. They did this for us, and they do it everyday. Everyday they help children who have been so hurt in this world. They take children who arrive in pressure blankets and sound canceling headphones and guide them to a place of peace where they can learn and flourish. They take children who come without friends who have been taunted and ridiculed and help restore their self-esteem. The teachers and staff of Ivymount remember what it feels like to be a child. They remember the battleground of the school yard. They know the importance of being allowed to join the play. So I said yes. I would speak, and I would paint. I would paint a playground. And I would speak of Freddie. This is a closed data loop. In health information technology circles we often speak of closed data loops. The patient’s medical record may be easily viewed by the doctor or institution, but not by the patient. I often think of hoops in relation to this discourse. I think of circuits, rings, circles, loops, and Galilee. I even wrote a poem about it called “Wheals on the Bus.” In this painting I am trying to convey the awful isolating power of the closed data loop. The doctor/child is very self-satisfied. She sways within her hula-hoop listening to her headphones. Her eyes are closed, and she is smiling. The patient/child looks on as if a sorrowing icon. His clothing is half patient gown and half Roman column. He is fixed in place with no avenue for communication. The sky above is covered by a glaucoma-filled eye. The all-seeing eye is blinded, and the loop remains closed. This is an example of point to point communication. So in this piece we have the concerned patient/child looking into the distance. She holds her sad small PHR (personal health record) in her hand. It looks like a toy silo with a cute little toy tractor. It is a toy; and good for pretending, but it does not communicate within the larger HIE (Health Information Exchange.) 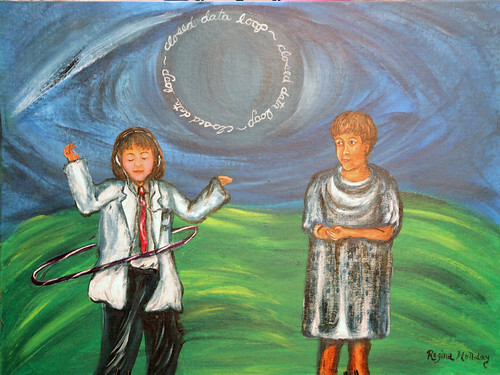 To the patient/child’s left two doctor/children are engaged in a rousing moment of double dutch jump roping. Their information surges back and forth within a double helix made of pills and pixels. In the center jumps the joyous hospital administrator. She jumps happily within the spinning data loops as other executives wait their turn. While I painted, I felt the power of the tragic stories told on Caring Bridge combined with the endless sharing of Facebook. I saw what could happen when you do not quiet sickness and death, but instead share the message far and wide. So in this painting Caring Bridge marries Facebook. They are zooming by in shiny, red car. Behind them trails a just married sign upheld by the Twitter bird. Also trailing behind are tin-can phones. Those phones connect you to social media. The administrators and executives waiting in line to play EMR double-dutch are communicating via these phones. They may not yet have grasped the importance of implementing a fully functioning and patient participatory EMR (Electronic Medical Record), but if social media is doing its job, with every post, tweet, or share, we are showing them there is a better way. 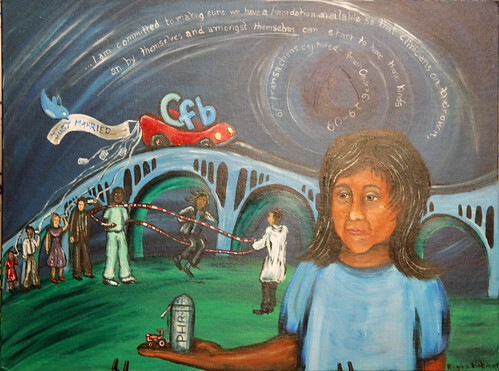 And I wonder if you noticed the bridge in the painting is a modified image of the Key Bridge, because this is truly the key to making health care work for us all. We must have open communication at every step of the way. The final painting has an unfinished look about it. This is a scene where doctors, patients, administrators and members of pharma all are holding up the play parachute. They are joyous. They are bouncing data balls into the air. Those data balls spell HIE. This is what a fully functioning health information exchange should look like. We should all be linked together in a circle: included, not excluded. 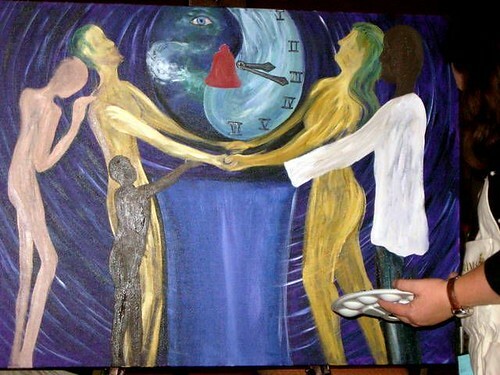 The painting is unfinished because we are not at that point yet. These figures are still ephemeral, but they are holding up the parachute. Playing with a parachute is fun. It billows so nicely, and the silk is so smooth, but we should never forget the reason we have parachutes. Parachutes save lives, but only if you can pull the cord. A parachute that is packed away and inaccessible will not help as you fall. This final painting in the series I began on the first day. There is an elephant in the sky. I painted this as Kevin spoke of the elephant in the room when we speak of medicine and compliance. That long-suffering elephant has been a beast of burden, hauling its stacks of medical records from doctor to doctor and from place to place. The elephant remembers how it has been treated and seems so gentle and quiet until it trumpets warning. Well, if you haven't figured it out yet. I am trumpeting! I have hauled brushes and paints. I have carried reams of records. I am an e-patient. I am a mother, a poet, and an artist, and I am ringing the claxon. We will no longer be quiet. We will question like the mind of a child: always searching, always learning and bringing something new to the equation with every point we make. At the close of my speech I shared my poem “The Wheals on the Bus.” One line is “ARRA! Arise!” As I finished speaking, the audience did indeed arise. An amazing energy filled the room, and I knew the elephant had come into its own. We were all standing up ready to grasp the parachute and send the ripples far and wide. Now we must go forth in the world as empowered e-patients and change everything!